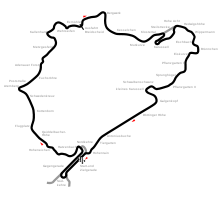 The 1971 German Grand Prix was a Formula One motor race held at Nürburgring on 1 August 1971. It was race 7 of 11 in both the 1971 World Championship of Drivers and the 1971 International Cup for Formula One Manufacturers. The race returned to the Nürburgring after a year at the Hockenheimring after the safety was improved on the track. The race distance was shortened to 12 laps. Notable driver changes included Vic Elford, who replaced Pedro Rodríguez. Jackie Stewart took pole and dominated the race, leading home a Tyrrell 1-2. Clay Regazzoni finished third with Mario Andretti, Ronnie Peterson and Tim Schenken rounding out the points. Mike Beuttler was disqualified on the third lap after entering the pits via the "short chute", after suffering a flat tire just after passing the pits, and not wanting to drive 14 miles on a flat tire. Jo Siffert was also disqualified on lap seven for taking the short chute into the pits, after his right-hand lower front wishbone started detaching from the chassis and his ignition coil started acting up. ^ Pritchard, Anthony (1972). The Motor Racing Year No3. ISBN 0393085023. ^ "1971 German Grand Prix". formula1.com. Archived from the original on 16 October 2013. Retrieved 22 December 2015. ^ a b "Germany 1971 - Championship • STATS F1". www.statsf1.com. Retrieved 18 March 2019. Wikimedia Commons has media related to 1971 German Grand Prix. "Formula One World". Archived from the original on 16 January 2007. Retrieved 19 January 2008. "Grandprix.com". Archived from the original on 1 April 2010. Retrieved 11 May 2010. This page was last edited on 18 March 2019, at 12:46 (UTC).